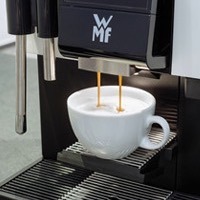 Coffee Cloud Ltd are the NZ distributor for WMF Coffee Machines for the commercial sector.We have chosen WMF for its superior technology and sustainability. WMF is the independently certified leading international manufacturer of fully automatic coffee machines. Each machine is manufactured at their plant in Geislingen, Germany and is designed with the coffee maker in mind – high quality German innovation and engineering since 1927. WMF globally has sales and service centres in 90 countries, with more than 1850 people in the field. There are currently more than 350,000 WMF coffee machines in the global market. WMF achieved the "Global Market Leader Champion 2017" in the "Commercial Automatic Coffee Machines" category of the Weltmarktführer-Index 2017 (Global Market Leaders Index 2017). Containing a total of six categories, the Global Market Leaders Index – run by the University of St. Gallen in Switzerland and the Akademie Deutscher Weltmarktführer (Academy of German Global Market Leaders) – highlights top performers from some 20 industries and three different countries. Honoured with a special mention of its WMF espresso semi-automatic coffee machine in the category ‘Excellent Product Design Kitchen’ for 2017 by the German Design Award, WMF is one of the most recognised design competitions in the world. From the touch of the display button to the intuitive cleaning process, German quality and innovation is evident. The WMF Plug and Clean system was the first HACCP compliant automated cleaning system. This patented technology means cleaning is exceptionally easy and maintain. WMF are the independently certified industry leaders in automatic coffee machine energy efficiency (HKI Cert, Jan 2013). WMF are ISO 9001 & ISO 14001 Certified, a worldwide recognised system, assurance of their quality, efficiencies and consistent performance and service in every coffee machine. A premium world-renowned brand, WMF consistently sets the standard in coffee machine technology. 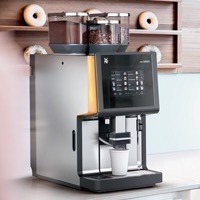 Easy to clean and manage, from the professional corporate environment or 5 star hotel to the premium foodservice industry and QSR environment, there is aWMF Super Automatic coffee solution that suits you. The WMF Plug & Clean system was the first HACCP compliant automated cleaning system to ensure ease of use in safety and operation. This patented technology means cleaning is exceptionally easy to operate and maintain. The WMF Brewer is easily removed by hand and basic maintenance can be done by you, due to clever engineering and design. This makes service calls a rare occurrence and minimises equipment downtime. The WMF Milk Systems (Active & Easy) utilise a unique pump design & pinch valve to give exceptional quality milk and micro-foam. The system is electronically adjusted which gives consistently accurate milk temperature and cup levels.